These days, collaboration among manufacturers and the metal fabrication industry in a meaningful way can ensure projects are completed successfully and on-time. Companies are discovering that building long-term relationships is crucial to long-term success. There are many key considerations to keep in mind when choosing the right metal fabrication shop, but for metal fabricators, nurturing and building a reliable, collaborative network of noncompeting companies can provide the necessary edge to compete and succeed in the market. Four or five decades ago, the relationship between manufacturers and the metal fabrication industry was a steady, working, interrelated one. Manufacturers turned to fabricators to subcontract important projects that could not be met in-house to complete jobs. Then globalization changed the manufacturer-metal fabricator landscape. Manufacturing became viewed as a commodity in the global supply chain by Wall Street and investors. “How low can you go?” became the mantra, not who you were or where your company was located. Previous working relationships mattered less as the lowest price point was found in Asia. In the global supply chain, metal fabricated parts were just as much of a commodity, with efficiency rather than quality driving a competitive wedge through the industry and fracturing long-standing relationships between manufacturers and metal fabricators. A fabricated part was simply a piece in the global supply chain puzzle and it didn’t matter where it came from, so long as the price was right. In the last several years, the grip Asia has held on the global supply chain has loosened as wages there have increased. The relentless, competitive low price points that drew industry there can no longer be sustained. With that shift, once fractured relationships are on the mend. The opportunity of manufacturers and the metal fabrication industry for collaboration have never been greater. Collaboration can play a crucial role in the success of any metal fabrication company. 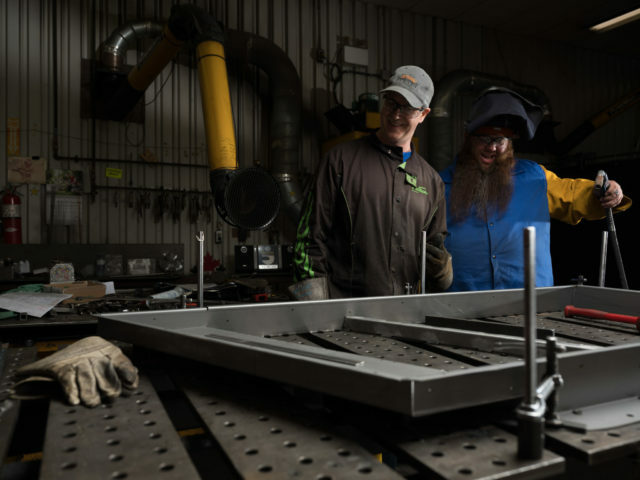 More than just subcontracting out a particular job for laser cutting or powder coating; spot welding or forming – building relationships, connections, and networking are the keys to long-term success. Being part of a noncompeting, collaborative manufacturing-metal fabrication network allows multiple companies to compete as one. Whether an engineering firm that has won a contract for design, or a small manufacturer that has exceeded plant capacity, in a collaborative network all companies benefit. Mutually beneficial relationships among companies allow for much more flexibility. They are able to retool more quickly and meet the demand for low, medium or high volume runs. Working in collaboration also minimizes risk, increases profit margins, and allows companies to grow together. One-stop metal fabrication shops that partner and network with other companies can provide additional services, say, if machining or plating is necessary. Contract manufacturers and job shops outside of a network can also be subject to delays. Projecting lead times on a job can be difficult. One subcontractor late on a job can cause everyone else in the supply chain to be late in delivering finished products on time. Companies working in collaboration can coordinate production schedules, or adjust schedules as needed, providing consistency and reliability to clients and customers. Finally, collaboration among metal fabricators and manufacturers also allows for better communication with customers. Questions from customers concerning a specific process can be answered quickly within the network. Metal fabrication is as much of an art as it is a business. It’s a niche industry requiring expertise in the art. In a collaborative network, custom and precision metal fabrication shops can provide the answers quickly to specific processes and move the process forward to complete the project on time. Manufacturers and metal fabrication companies competing in the marketplace in a collaborative effort is crucial to overall success. Working together translates into operational efficiencies, shortened lead-times, and a competitive position. More than a trend, companies that work in collaboration, over the long term, are far more sustainable. Want to learn more about Quest-Tech and the metal fabrication capabilities we offer? Contact us online to speak with an expert today.